New Journal, Welcoming Submissions Soon – Our brand new publication Journal of Future Robot Life will be opening for submissions in May 2019. Check back soon for more details! 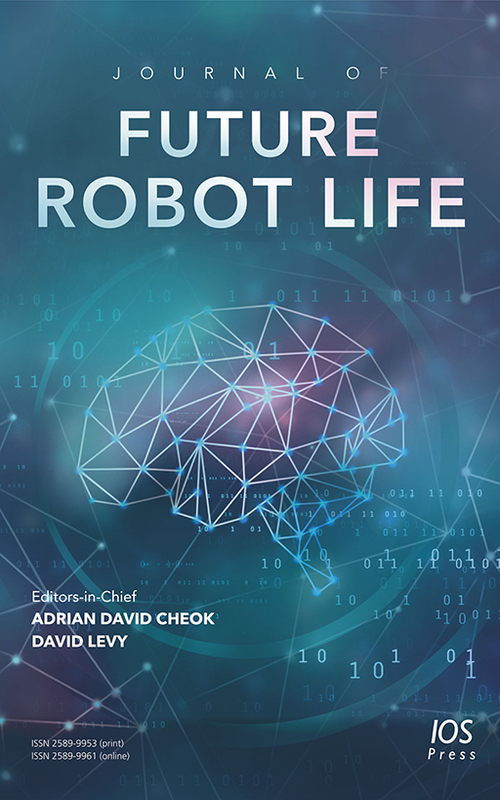 Open Access Fee Waiver – Journal of Future Robot Life is an open access journal and we are pleased to announce that the open access fees are waived for papers submitted in 2019 and 2020. What will robots be like ten, twenty and more years from now? What will they be able to accomplish? How will human–robot relationships have advanced? What place in society will be occupied by robots? These are just some of the questions which will be debated in the pages of this new publication – the Journal of Future Robot Life. Computer science and artificial intelligence (AI) have had a huge impact on society, an impact that will only increase with further advances in hardware and software technologies. Robots are the most remarkable product of these developments in computing and AI, many of them being designed in a humanlike form and endowed with humanlike capabilities: talking, hearing, seeing, moving and performing complex tasks such as dancing, conducting an orchestra, rescuing victims at disaster sites, playing musical instruments, and beating a world champion at chess. As robots become more humanlike in their appearance and their capabilities, and as they come to be regarded more and more as our companions and assistants in all aspects of daily life, different questions beg to be answered. We need to contemplate what life will be like when robots can imitate human behavior sufficiently to be regarded, in some sense, as our equals. And when we humans have adapted our ways of life in order to interact fully with robots as alternative people, and to benefit fully from our relationships with them, such questions on the future of human–robot interactions and human–robot relationships are the raison d’etre of this journal. What civil rights and legal rights should robots be granted? What are the ethics of humankind’s interactions with robots? Will robots have empathy? Will their personalities and emotions mimic our own? Will robots be programmed with social intelligence, or can they acquire it through a learning process? Will robots be alive in any humanlike sense, and if so, how? This journal will be open for submissions in May 2019. Journal of Future Robot Life is an Open Access journal. Published papers are currently not subjected to an Open Access fee. They will be published freely available for download through content.iospress.com at no charge to the authors. For initial submission a .pdf file of the article is sufficient. After an article has been accepted for publication an editable file of the text, such as MsWord or LateX, is required. If you are uploading a paper that has been accepted for publication or accepted pending minor revisions please upload the source files of the paper. If using LaTeX please use the standard article.sty as a style file and also send a pdf version of the LaTeX file as well as separate files of all figures (if any); see "Preparation of manuscripts" for the required file formats. LaTeX packages should be compiled into .zip or .rar files. In the online version all figures in an article will appear in colour. It is possible to have figures printed in colour also in the paper version of the journal, provided the cost of their reproduction is paid for by the author. If your article is accepted for publication you will be provided with information regarding this option in the galley proofing stage. See "Preparation of Manuscripts" for the required file formats. Journal of Future Robot Life publishes all articles online with 'pre-press' (meaning they are published online shortly after acceptance, before being published in an eventual issue of the journal). The pre-press articles are the uncorrected galley proof versions of the article and are published online shortly after the proof is created. Pre-press articles are fully citable using the article DOI number. As soon as the pre-press article is assigned to an issue, final author corrections will be incorporated and final bibliographic information will be added. The pre-press version will then be replaced by the updated, final version. Number as Table 1, Table 2, etc., and refer to all of them in the text. All tables should be contained within the manuscript itself, and embedded in the text. Each table should have a brief and self-explanatory title. Column headings should be brief, but sufficiently explanatory. Standard abbreviations of units of measurement should be added between parentheses. Vertical lines should not be used to separate columns. Leave some extra space between the columns instead. Any explanations essential to the understanding of the table should be given in footnotes at the bottom of the table. Number figures as Fig. 1, Fig. 2, etc., and refer to all of them in the text. All figures and other graphics should be contained within the manuscript itself, and embedded in the text. Colour figures can be included, provided the cost of their reproduction is paid for by the author. For the file formats of the figures please take the following into account: - line art should be have a minimum resolution of 600 dpi, save as EPS or TIFF - grayscales (incl photos) should have a minimum resolution of 300 dpi (no lettering), or 500 dpi (when there is lettering); save as tiff - do not save figures as JPEG, this format may lose information in the process - do not use figures taken from the Internet, the resolution will be too low for printing - do not use colour in your figures if they are to be printed in black & white, as this will reduce the print quality (note that in software often the default is colour, you should change the settings) - for figures that should be printed in colour, please send a CMYK encoded EPS or TIFF Figures should be designed with the format of the page of the journal in mind. They should be of such a size as to allow a reduction of 50%. On maps and other figures where a scale is needed, use bar scales rather than numerical ones, i.e., do not use scales of the type 1:10,000. This avoids problems if the figures need to be reduced. Each figure should have a self-explanatory caption. The captions to all figures should be typed on a separate sheet of the manuscript. Photographs are only acceptable if they have good contrast and intensity.